Sierra Pacific Industries to log east of Oroville, CA. This THP is about 6 miles NW of Camptonville, CA and about 20 miles east of Oroville, CA at an elevation of 2,700 to 3,400 feet. Sierra Pacific Industries is planning a tractor based logging operation in Douglas fir, ponderosa pine, sugar pine and white fir forests. The THP area flows into the New Bullards Bar Reservoir, a popular fishing, boating and swimming destination with 2 powerhouses and a campground. SPI wants to construct an in-stream waterhole near a spring along Empire Creek, and re-construct an existing skid crossing through Empire Creek. There are 3 CA spotted owl nesting territories within 1.3 miles of the THP area, including a CA spotted owl nesting territory within .1 mi of the THP area in section 12, and a CA spotted owl nesting territory within .73 mi of the THP area in section 23. 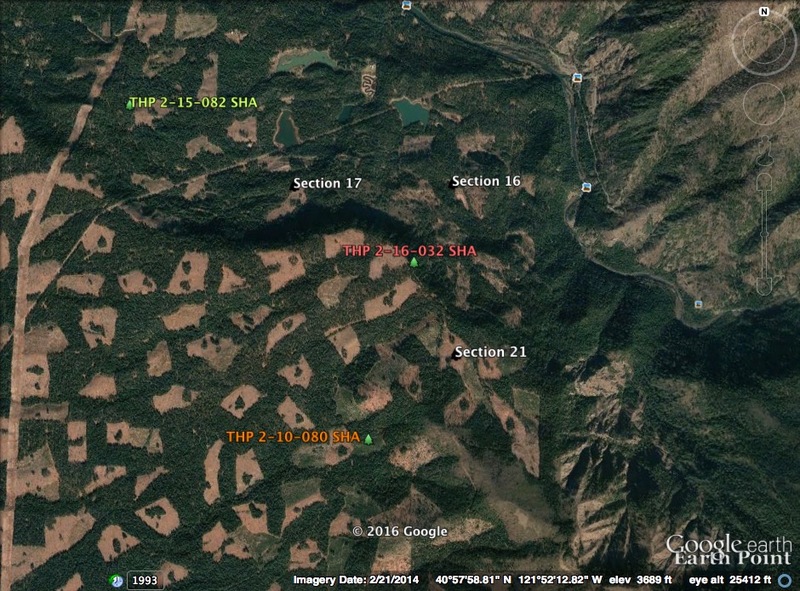 Green Diamond Resource Company to clearcut log near the town of Smith River, CA. 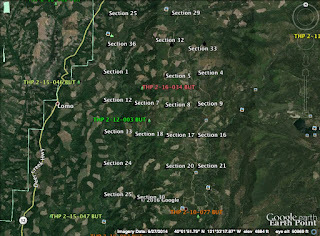 This THP is about a mile north of the town of Smith River, CA and Highway 101 near the CA/OR border. 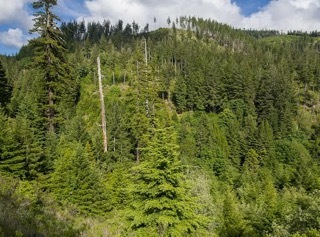 Green Diamond Resource Company is planning a tractor and cable logging operation on steep and unstable slopes in western hemlock, redwood, Sitka spruce and Douglas fir forests. There are 2 landslide terrain sites within a class II (mid sized) watercourse along the northern boundary of unit H. Five road drainage sites are planned for work including rocking, dip construction, ditch cleaning, culvert repair/replacement and restoration of washed out crossings. There is a historic bald eagle nest (1974) .5 mi south of unit I, and southern torrent salamanders are known to occur immediately adjacent to units B, E and H. Two old growth trees will be retained as Townsend's Big Eared bat trees including a 45" dbh western hemlock tree, and a 52" dbh Sitka spruce tree within unit D. Spotted owl nesting territories are located within .5 mi of units F, G and I.
Sierra Pacific Industries to clearcut log trees up to 50” dbh adjacent to the Chanchelulla Wilderness Area. 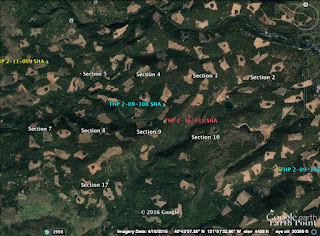 This THP is about 16 miles south of Weaverville, CA and about 12 miles SE of Hayfork, CA at an elevation of 3,600 to 5,200 feet. 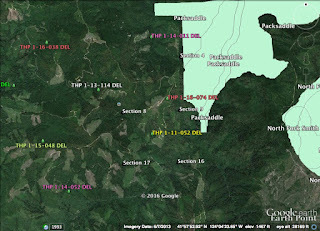 Sierra Pacific Industries is planning a clearcut tractor based logging operation in Douglas fir, ponderosa pine, incense cedar, sugar pine and white fir forests next to the Chanchelulla Wilderness Area (units 2394 and 2405 are adjacent). The THP area flows into the Trinity River which is listed as an impaired watershed for sediment and siltation. There is an unstable area in the northern portion of section 36 outside of THP units. Sierra Pacific Industries is planning to use ground based equipment on slopes over 50% grade with a high erosion hazard within units 2394, 2400 and 2403, and on slopes between 50% and 65% grade to construct fire lines and water bars within units 2404 and 2405. SPI also wants to use an existing skid trail within the outer edge of a class II (mid sized) watercourse in unit 2404, and an existing skid trail and landing inside a class II (mid sized) watercourse in unit 2404. Ternate buckwheat was found along the NW boundary of unit 2394. A spotted owl nesting territory is located within 1.3 miles of the THP area. 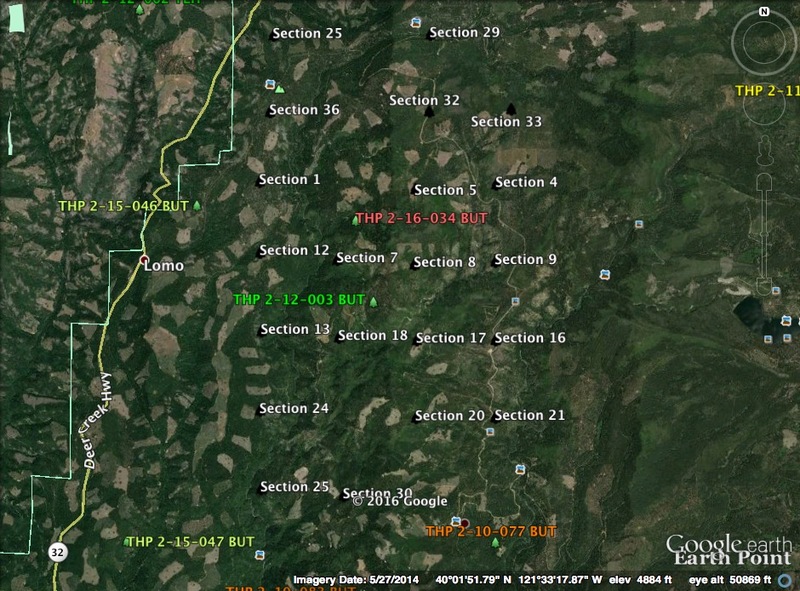 Green Diamond Resource Company to clearcut log at the Highway 299 coast range summit. 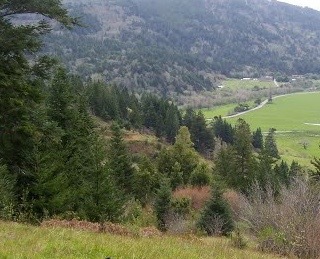 This THP is about 9 miles NE of Arcata, CA near the Highway 299 coast range summit at an elevation of 880 to 2,300 feet. Green Diamond Resource Company is planning a tractor and cable logging operation on steep and unstable slopes (units F and G) in redwood, Douglas fir, grand fir and western hemlock forests. The THP area flows into the Mad River which is listed as an impaired watershed for sediment, temperature and turbidity. 214.5 acres of selection logging and thinning is planned adjacent to Highway 299 to hide the visual effects of clear cutting. A Cooper's hawk was reported .4 mi north of unit A, and there are spotted owl nesting territories within .5 miles of units G and K.
Green Diamond Resource Company to clearcut log near Patrick’s Point State Park. 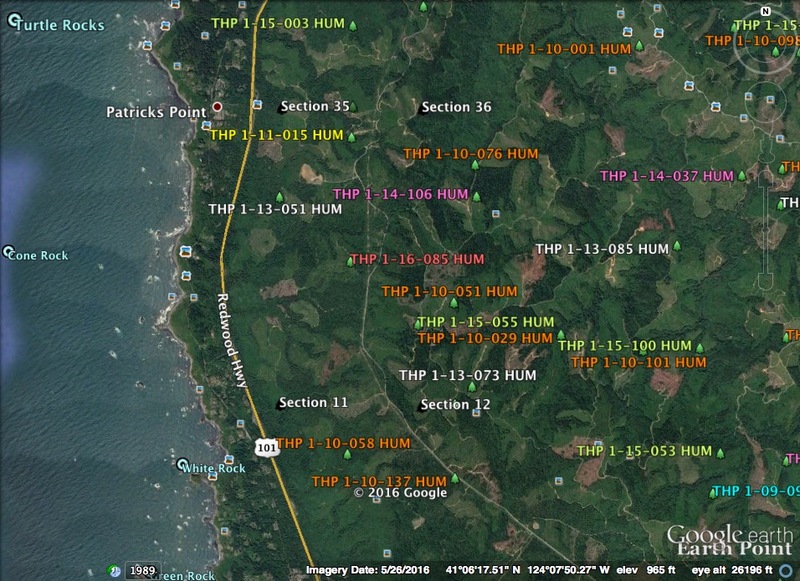 This THP is about 3 miles north of Trinidad, CA and within a mile of Patrick’s Point State Park and Highway 101 at an elevation of 400 to 800 feet. Green Diamond Resource Company is planning a mostly clearcut tractor based logging operation in redwood, Douglas fir, Sitka spruce and Bishop pine forests. Potential marbled murrelet habitat exists on Harry Merlo State Recreation Area land within .25 mi of the LP Mill haul road. An osprey nest is located within .25 miles of the LP Mill haul road, and 4 osprey nests are located within .5 miles of unit B and a seasonal road. Running pine was found adjacent to a class II (mid sized) watercourse inside unit A. There is a spotted owl nesting territory within 1.3 miles of the THP area. Sierra Pacific Industries to clearcut log north of Lake Shasta. This THP is about 25 miles north of Redding, CA and about 5 miles north of Lakehead, CA near Lake Shasta at an elevation of 2,000 to 3,500 feet. 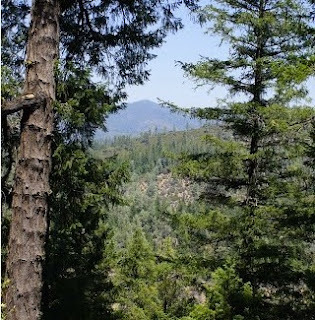 Sierra Pacific Industries is planning a clearcut tractor and cable logging operation on steep and unstable slopes in Douglas fir, ponderosa pine, sugar pine, white fir and incense cedar forests. There is an unstable area along a road in section 13 outside of THP units. Sierra Pacific Industries is planning to use ground based equipment on steep slopes over 65% grade within unit 13D. Sections 9 and 15 are adjacent to the West Girard roadless area. An osprey sighting (2003) was reported just south of the community of Sweetbriar, and a western pond turtle was reported to be 2 miles downstream of the THP area along north salt creek. There is 1 spotted owl nesting territory within 1.3 miles of the THP area. 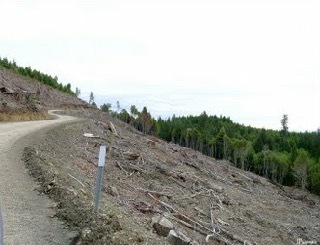 Green Diamond Resource Company to clearcut log east of Arcata, CA. This THP is about 8 miles east of Arcata, CA and about 3 miles east of Blue Lake, CA and Highway 299 near the coast range summit. Green Diamond Resource Company is planning a mostly clearcut tractor and cable logging operation on steep and unstable slopes in Douglas fir, redwood, Sitka spruce, western cedar, grand fir and western hemlock forests. The THP area flows into the mad river which is listed as an impaired watershed for sediment, temperature and turbidity. There are 7 landslide terrain sites and road failure sites including a landslide along the northern portion of unit B, a cut bank failure along the southern portion of unit B, a small unstable area in the cable portion of unit F, 3 small unstable areas along the eastern portion of unit F, an unstable area in unit D and an old fill slope failure along the CB-1300 road in unit E. Green Diamond Resource Company is planning to use ground based equipment on the CB-1100 road within a class II (mid sized) watercourse in unit A. Five road drainage sites are planned for work including rocking, dip construction, ditch cleaning and culvert repair/replacement. A sharp shinned hawk was sighted 1.6 miles west of the THP area, Del Norte salamanders were reported to be in unit E, and there are historical (1990) reports of Sonoma tree voles in units E and F. Tailed frogs and southern torrent salamanders are known to occur in most of the streams in the watershed. 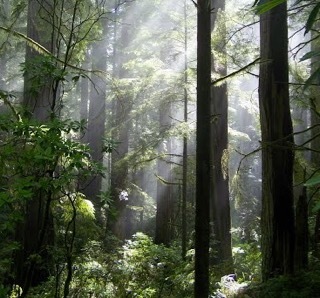 There are spotted owl nesting territories within .25 mi of units B, D, F and I, and within .5 mi of units A, C, E, G and H.
Humboldt Redwood Company to log inside large tree marbled murrelet stands south of Grizzly Creek Redwoods State Park. 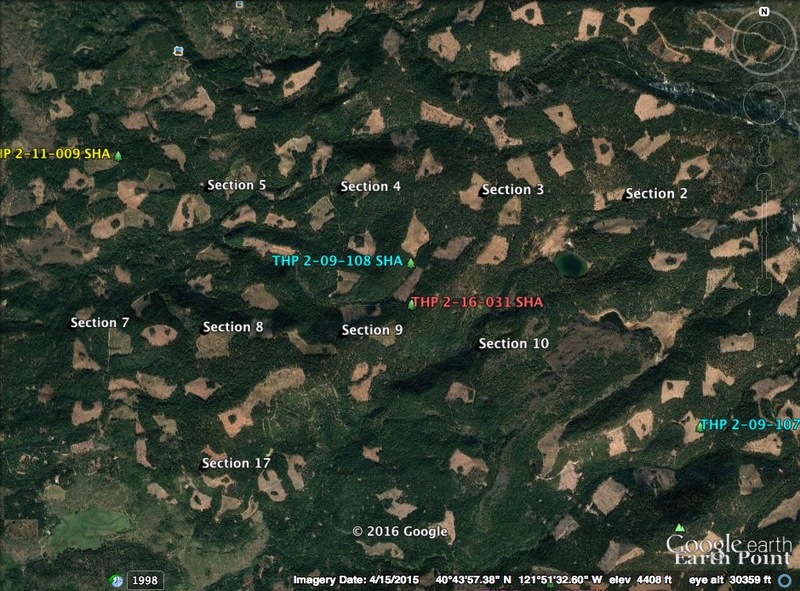 This THP is about 10 miles SE of Scotia, CA and about 1.2 miles west of Swains Flat, CA near Grizzly Creek Redwoods State Park. Humboldt Redwood Company is planning a tractor based logging operation on steep and unstable slopes in redwood, Douglas fir and grand fir forests at an elevation of 1,030 to 1,800 feet. The THP area drains into the Van Duzen River which is listed as an impaired watershed for sediment, sedimentation and temperature. There are active inner gorges, debris slides, cut bank, and fill slope failures mostly related to class II (mid sized) and class III (intermittent) watercourses throughout the THP area. 12 road drainage sites are planned for work including rocking, dip construction, culvert repair/replacement and restoration of washed out crossings. Large tree marbled murrelet stands D377 and D581 are proposed for harvest (tree size not listed in the THP). There are 6 spotted owl nesting territories within 1.3 miles of the THP area. 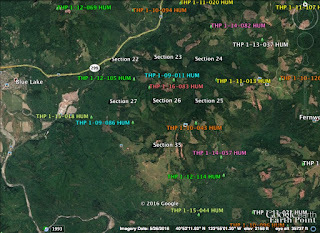 Roseburg Resources Company to clearcut log NW of Burney, CA. 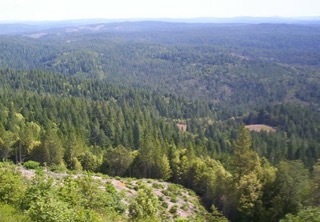 This THP is about 30 miles NE of Redding, CA and about 10 miles NW of Burney, CA at an elevation of 2,320 to 4,000 feet. Roseburg Resources Company is planning a clearcut tractor and cable logging operation in Douglas fir, white fir, incense cedar, sugar pine and ponderosa pine forests. Roseburg Resources Company is planning to use tractors inside areas designated for cable logging to construct fire breaks and for site preparation activities. There are osprey nests nearby along the Pit River, and a western pond turtle was reported to be one mile NW of the THP area at Tunnel Reservoir. One spotted owl nesting territory was reported within 1.3 miles of the THP area. 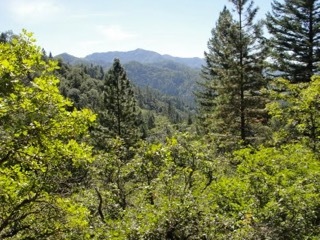 This THP is about 25 miles NE of Redding, CA and about 10 miles SW of Burney, CA at an elevation of 3,420 to 4,960 feet. Roseburg Resources Company is planning a clearcut tractor and cable logging operation in Douglas fir, white fir, incense cedar, sugar pine and ponderosa pine forests. There are 4 unstable areas related to instability of slopes above a creek (class II mid sized) watercourse in units 304 and 400. 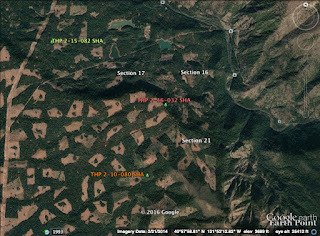 Roseburg Resources Company is planning to use tractors inside areas designated for cable logging to construct fire breaks and for site preparation activities. 25 road drainage sites are planned for work including rocking, dip construction, culvert repair/replacement and restoration of washed out crossings. Pacific fisher sightings were reported in sections 9 and 16 according to THP maps, and a cascade frog was reported to be 1.5 miles SW of the THP area at Silver Lake. There are western pond turtles 2 miles west of the THP area, and foothill yellow legged frogs were reported to be 2 miles south of the THP area. Three populations of rattlesnake fern were reported; two in unit 404W, and one in unit 800W. 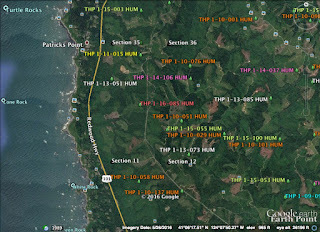 Sierra Pacific Industries to clearcut log east of Eureka, CA. 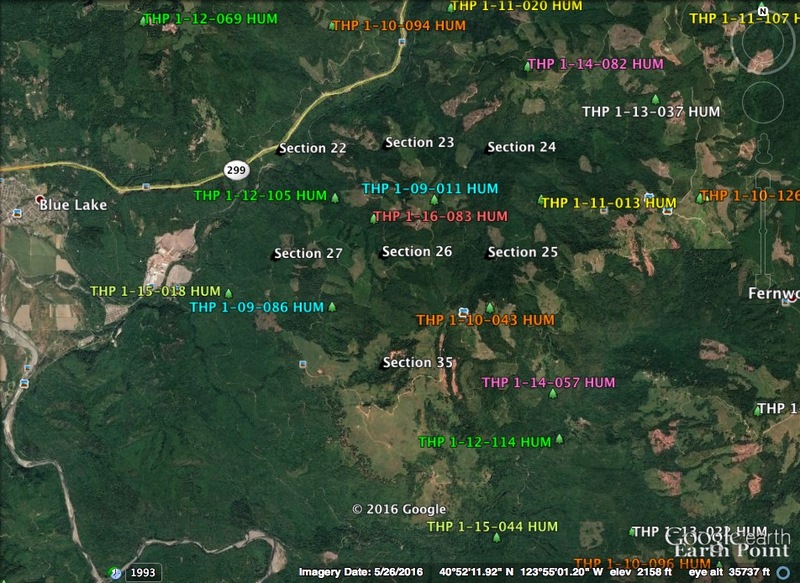 This THP is 20 miles east of Eureka, CA and 11 miles SW of Willow Creek, CA at an elevation of 2,480 to 4,400 feet. Sierra Pacific Industries is planning a mostly clearcut tractor and cable logging operation in Douglas fir forest. The THP area flows into Redwood Creek which is listed as an impaired watershed for sediment/siltation and temperature, and the Mad River which is listed as an impaired watershed for sediment/siltation, temperature and turbidity. Three road drainage sites are planned for work including rocking, dip construction and culvert repair/replacement. There are 9 spotted owl nesting territories within 1.3 miles of the THP area. This THP is about 5 miles NE of the town of Smith River and a few miles south of the California/Oregon border at an elevation of 200 to 1,700 feet. Green Diamond Resource Company is planning a mostly clearcut tractor and cable logging operation in redwood, Douglas fir and western hemlock forests. There are unstable areas (shallow rapid landslides) located in units B, C, G and H. Green Diamond Resource Company is planning to construct 150 feet of seasonal road on slopes over 65% grade in unit D. Three road drainage sites are planned for work including rocking, dip construction, culvert repair/replacement and restoration of washed out crossings. Potential marbled murrelet habitat exists in the packsaddle roadless area within 300 feet of unit C on USFS land, and within .25 miles of seasonal roads in unit C. A Del Norte salamander was reported in 2010 in unit E, tailed frogs were reported within or adjacent to units C and D, and southern torrent salamanders were reported within or adjacent to units A, C, D, and E. There is a 7 foot diameter old growth tree in unit C that will be retained as a potential Townsend's big eared bat tree. Spotted owl nesting territories are located within .5 mi of units C, E, F, G and H.
Green Diamond Resource Company to clearcut log south of the town of Klamath, CA and the Klamath River. This THP is a few miles south of the town of Klamath, CA, where the Klamath River meets the Pacific Ocean, and a mile east of Highway 101 at an elevation of 60 to 1,000 feet. Green Diamond Resource Company is planning a mostly clearcut tractor and cable logging operation in redwood, Douglas fir and western hemlock forests. The THP area flows into the Klamath River which is listed as an impaired watershed for sediment, temperature, nutrients and dissolved oxygen. Nine road drainage sites are planned for work including rocking, dip construction, culvert repair/replacement and restoration of washed out crossings and sink holes. A bald eagle nest is located within 120 feet of the Klamath River and .42 mi east of the MG-400 haul road, and 8 osprey nests are located within .25 mi of seasonal roads and the MG-10 haul road. 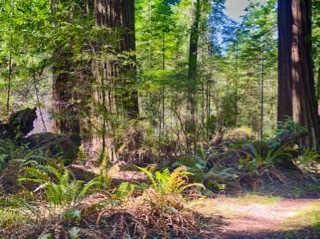 There is a great blue heron rockery 1.3 miles NE of the THP area, and a 12 foot dbh redwood tree with a large cavity will be preserved as a bat tree that is located 70 feet from the boundary of unit D.